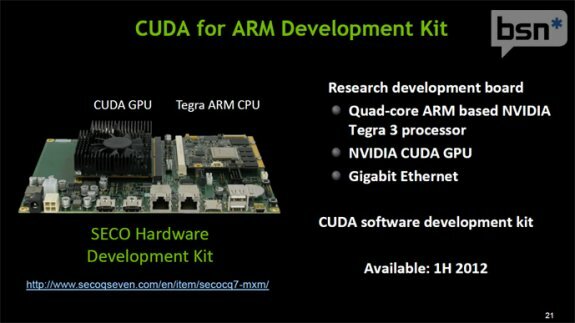 The concept of "CUDA for ARM Development Kit" is quite simple: pair a dual-core Tegra 2 or a quad-core Tegra 3 SoC with an CUDA-enabled GPU, be that GeForce or a Quadro in MXM form factor. In order to build this solution, NVIDIA turned to their skunkworks project company, Italian company Seco s.r.l. SECOCQ7-MXM is the name of a host board which fits QUADMO747-X/T20 (Tegra 2) and QUADMO747-X/T30 (Tegra 3) boards from one side, and any MXM 3.0 Type A or Type B graphics card from another. The combination is already supported in the CUDA Software Development Kit, but you will have to wait until next year to acquire the kit (estimated availability 1H 2012).